Meet the researchers we’ve supported, and learn more about what they’re working on. Alfonso L. Sabater, M.D., a fellow at the Bascom Palmer Eye Institute,is working on a method to regenerate corneal endothelial cells. These cells, which make up the innermost layer of the cornea, work to keep the cornea clear. When endothelial cells become diseased or damaged, they die. Unlike some other cells in the body, corneal endothelial cells do not grow back: once gone, they’re gone forever. Some cell loss is considered a normal part of aging. However, when a person loses too many corneal endothelial cells, their eyesight is affected. The fact that these cells are not normally capable of regeneration is exactly why we’re so excited about this research. Right now, the standard treatment for diseases of the corneal endothelium is a corneal transplant. Corneal transplants are safe and effective, and performed over 40,000 times per year in the US alone. However, a transplant is still a type of surgery, and Dr. Sabater’s research means we’re moving toward a future in which surgery might not be necessary. Using a unique combination of molecules, Dr. Sabater is investigating ways of growing corneal endothelial cells in the lab. His research explores several different ways this breakthrough can help patients. For example, one proposed use for this technology is in a medication, such as an eye drop. Patients in the early stages of endothelial disease could use this eye drop to stimulate regrowth of the damaged corneal cells, stopping cell loss in its tracks before it caused vision loss. 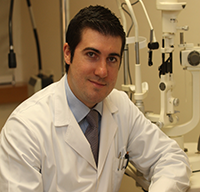 Beauty of Sight Foundation is honored to support the promising research of Dr. Sabater. We are looking forward to this innovation improving the lives of patients in the future. Retinitis Pigmentosa. Unlike most others with RP, Carmen received a retinal implant called the Argus II Retinal Prosthesis System, or in layman’s terms, a “bionic eye.” This device provides electronic stimulation of the retina to induce visual perception: basically, it aims to do the work the patient’s original retina no longer can. With this device, Carmen hoped to regain some of her vision. Although the technology behind the bionic eye is extraordinary, the picture the patient actually sees is much less detailed than human eyesight. Carmen cannot see things as she used to: instead, she sees shapes and movement represented by a grid of white dots on a black background. Deciphering what these white dots represented meant a big learning curve for Carmen. Unfortunately, the manufacturer of the device doesn’t offer any help to the recipients, so Carmen was left on her own. That’s where our friends at the Ophthalmic Biophysics Center at Bascom Palmer Eye Institute came in. With funding from the Beauty of Sight Foundation, these researchers created a customized training program for Carmen to help her learn to “see” again. Led by Jean-Marie Parel, PhD, the group developed specialized software and worked closely with Carmen to help her interpret shapes, light, and movement. With practice and support, Carmen was soon able to understand what these white dots represented. Before long, she was identifying letters and numbers, and practicing writing using a digital pen and tablet that projected images on to a computer screen. The Ophthalmic Biophysics Center plans to use the training program devised for Carmen to help other bionic eye recipients. The Beauty of Sight Foundation is proud to lend its support to this cutting-edge research effort.